Walking amongst the columns in the Abbazia di Sant’Antimo I felt disconnected from time. The cool interior of white marble was a rich contrast from the heat and powerful sun outside. As I silently glided down the left aisle I couldn’t help but marvel at the master sculpture work on the capitals. Finally arriving beside the altar, I noticed beams of light piercing through the windows along the ambulatory. I knew I didn’t have a lens that could capture the primordial feeling reverberating through me, but extending my tripod; I felt I had to at least try. Snapping a photo in the deep silence of the Abbey, the click of the lens sounded like a cannon firing. 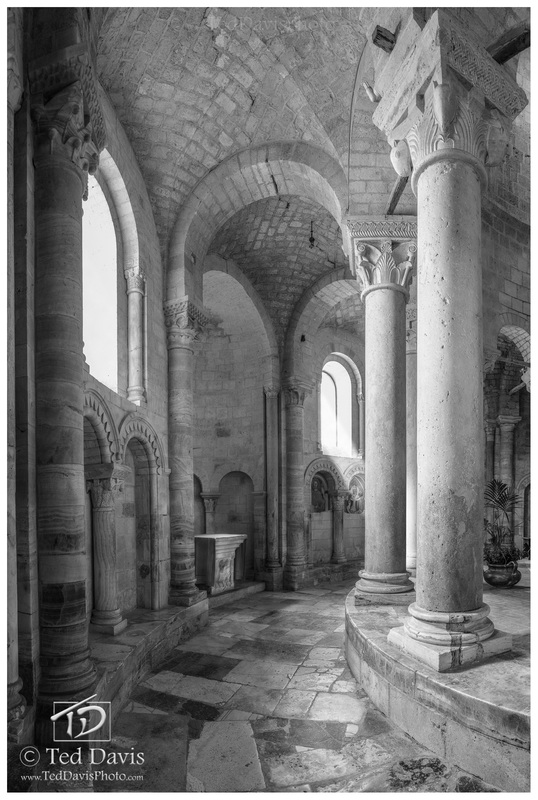 But I had my image, a beautiful black and white shot of the 900 year old Ambulatory echoing through time. Photo © copyright by Ted Davis.